Ship Weight : 10.5 lbs. 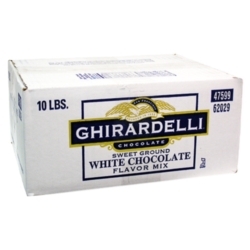 Ghirardelli Sweet Ground White Chocolate Powder is how white chocolate is meant to be savored. Its milky smooth taste complements all desserts and beverages. $0.30 / oz. $0.29 / oz. $0.28 / oz. $0.25 / oz.